This sarong is a sheer material that can be made fabulous in so many ways. Tie it up over your whole swim suit as a cover-up or tie it around your waist to make a cute cover-up skirt. To top that, show off your style by decorating it with a personalized design! 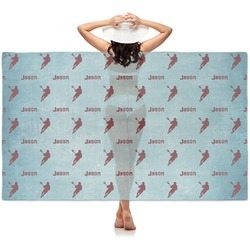 This sarong is 42" x 70" of personalized beauty. It is made of a soft polyester for comfort when against your skin. The material is sheer, so it serves well as a swimsuit cover-up or a shawl. There are so many uses for this wonderful product that you will be sure to find when it is in your hands. Go into the design center to get started designing your newest accessory. Choose from our thousands of backgrounds to put on your sarong. Choose something daring or subtle. Whatever you do, make it you. Love this product? Be sure to check out our apparel and accessories department. Look for our gorgeous faux pashmina scarf and our fun ladies leggings. Wow!!!! Gorgeous I cannot wait to use it. Great purchase.